The Hook Lake project is a joint venture between Cameco Corporation which owns 39.5 percent, Orano Canada which holds 39.5 percent and Purepoint comprising the additional 21 percent in the Patterson Uranium District, of Saskatchewan. 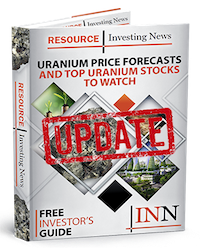 Purepoint Uranium Group (TSXV:PTU) has announced its plans for the Hook Lake drill program scheduled to commence this winter. The Hook Lake project is a joint venture between Cameco Corporation (TSX:CCO,NYSE:CCJ) which owns 39.5 percent, Orano Canada Inc which holds 39.5 percent and Purepoint comprising the additional 21 percent in the Patterson uranium district, of Saskatchewan. “In consultation with our JV partners, the 2019 winter program has been crafted to follow-up on the new mineralized shear zone interpreted earlier this year, extending along the Patterson Corridor.” said Scott Frostad, VP exploration. “A detailed ground electromagnetic survey has been proposed to help define the graphitic shear between the Spitfire trend and the Dragon zone and once again we will be deploying two drills to maximize the amount of work we intend to complete”. Located along the Patterson uranium district, the Hook Lake JV is a project owned jointly by Cameco Corporation (39.5 percent), Orano Canada Inc. (39.5 percent) (formerly known as Areva Resources Canada Inc.) and Purepoint (21 percent). Operated by Purepoint since 2007, the project consists of nine claims totaling 28,598 hectares including the Spitfire high-grade discovery (53.3 percent U3O8 over 1.3 metres within a 10 metre interval of 10.3 percent U3O8). The Patterson uranium district is a structural corridor lying across the SW edge of Saskatchewan’s Athabasca Basin, interpreted to extend at least 50km, hosting Fission Uranium’s Triple R deposit, NexGen’s Arrow deposit and Purepoint Uranium’s Spitfire discovery.